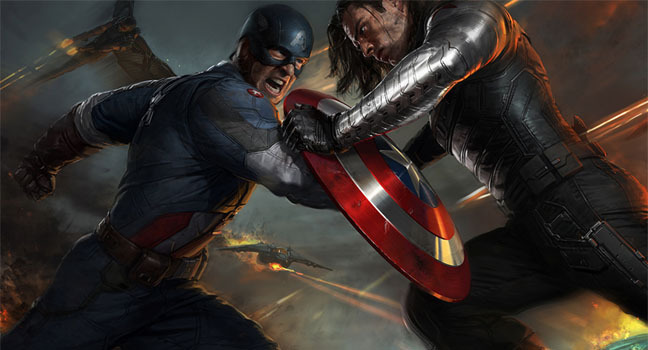 Captain America is back in “Captain America: The Winter Soldier,” the sequel to 2011’s “Captain America: The First Avenger.” ‘The Winter Soldier’ started out strong, earning over $300 million worldwide during its opening weekend. The film stars Chris Evans as Steve Rodgers (AKA Captain America), Scarlett Johansson as Natasha Romanoff (Black Widow), and Samuel L. Jackson as S.H.I.E.L.D. director Nick Fury. Sebastian Stan plays the brainwashed assassin Bucky Barnes—the Winter Soldier. ‘Captain America’ opens with a lighthearted scene between Rodgers and Sam Wilson, who is making his MARVEL debut as Falcon, running along Washington D.C.’s Reflecting Pool, and quickly transitions into an emergency mission on board a S.H.I.E.L.D. vessel where members are being held hostage. Rodgers is surprised to find Agent Romanoff aboard the vessel copying files from its computer database. This discovery prompts Rodgers voices his concern to director Nick Fury over the lack of honesty and trust in the agency. In response, Fury introduces him to Project Insight, a groundbreaking set of Helicarriers that will take out enemy threats. En route to rendezvous with agent Maria Hill, Fury is ambushed by enemies disguised as police. Among the madness of the ambush, the Winter Soldier makes a stunning entrance into the movie, blowing up Fury’s vehicle after a white-knuckle car chase. However, Fury manages to escape and hides out in Rodgers’ apartment to deliver a message: S.H.I.E.L.D. has been comprised, and not to trust anyone. After delivering the message, Fury is shot and killed by the Winter Soldier. After refusing to reveal to S.H.I.E.L.D. what Fury was doing at his apartment, Rodgers is proclaimed a target and becomes a fugitive of the agency. Rodgers teams up with Romanoff in order to find out the reasons behind Fury’s murder, and they wind up in an abandoned S.H.I.E.L.D. bunker, in New Jersey. Inside, the pair finds the trapped mind of Arnim Zola, which reveals that Hydra has infiltrated and taken over S.H.I.E.L.D..
‘Captain America’ mainly deals with the distrust within the S.H.I.E.L.D. agency, while also focusing on the complexity of characters Nick Fury (specifically looking at how and why he is the agency’s director) and Natasha Romanoff. The film itself was amazing. The acting was great, and the rewatchability of this film is high. With an outstanding plot, complete with angles and twists that viewers would not expect and a deeper message relating to our own controversial current state of national and homeland security, Captain America will win you over once again.